It’s been a hectic 4 days in Nairobi. The Westgate siege is now over, so the President tells us, though there will be a lot of cleanup and forensics to do. Three days of national mourning start tomorrow. The full Ushahidi team met yesterday (many virtually, of course), and we talked about many issues surrounding the Westgate siege. Not least amongst them was the fact that we had a hard time checking in with each other. And then found out that one of our team’s wife and 5 children were inside of the mall, while he was traveling out of country. They eventually got out a few hours later, to which we were relieved. This lead us to then think through our skills and tools, and where we could be useful. In an emergency, how do you find out quickly whether your family, your team, your friends are safe? How About a Way to “Ping” Your Group? 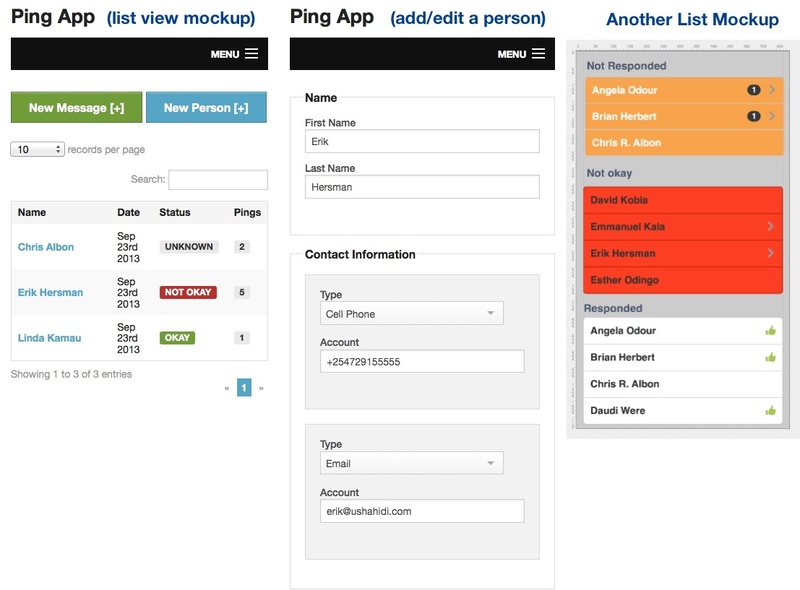 “Ping” is basically a binary, multichannel check-in tool for groups. The idea is that families and organizations could use this for quick headcounts on how everyone was, then use it as an on-ramp into a Red Cross missing persons index or something like Google’s People Finder app. You create a list of your people (family, organization), and each person also adds another contact who is close to them (spouse, roommate, boy/girlfriend, etc). 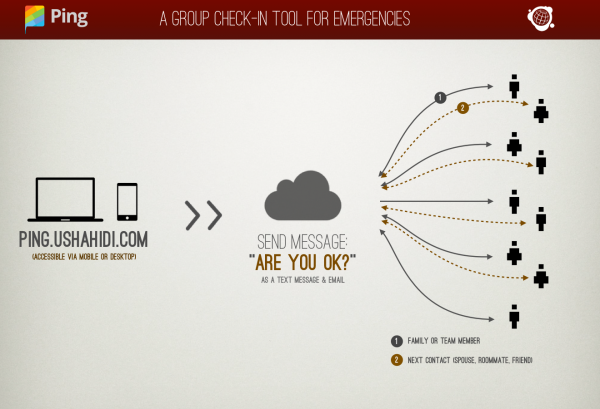 When a disaster happens, you send out a message for everyone to check-in. The admin sends out a 120 character message that always has “are you ok?” appended to the end. This goes out via text message and email (more channels can be added later). The message goes out three times, once every 5 minutes. If there is a response, then that person is considered okay. If no response, then 3 messages get sent to their other contact. We file each response into one of 3 areas: responded (verified), not responded, not okay. Every message that comes back from someone in that group is saved into a big bucket of text, that the admin can add notes to if needed. Yesterday we quickly wireframed out a list of needs, some design basics, and an architecture plan (images above), got a rough product going on it (code is on Github). We now need to make it look better, so some designers are working up some stuff to make it work well on both phones and computers. If you’d like to help out, jump on the Github repo, and get in touch with us about what you can do. What we have here is a minimum viable product (MVP) right now, open source, so anyone can make it better by branching the code and adding in features, etc.